Will “fringe” parties get elected? Is PR good or bad for the economy? Are MPs “appointed” off party lists? How stable is PR compared to first-past-the-post? How is voter turnout related to PR? Does PR give any party an advantage? To learn about the systems on the ballot in British Columbia’s referendum, please click here. 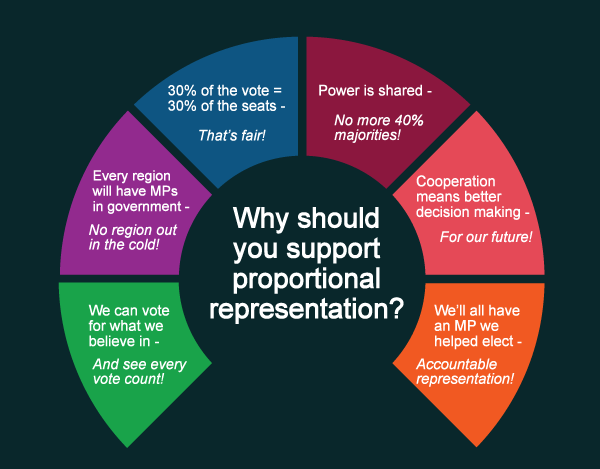 Proportional representation (PR) is a democratic principle specifying that people should be represented in proportion to how they voted. This means the percentage of seats a party has in the legislature should reflect the percentage of people who voted for that party. Under our current first-past-the-post system, voters elect a single representative in each single-member riding, no matter how diverse the voters in a riding may be. This makes it impossible for all voters in a riding to elect a representative that represents their values and priorities. In some ridings, 70% of the voters cast ballots which elect no-one. In contrast, any PR voting system elects several representatives at once for a given geographic region so that most voters in that region have a voice in Parliament. This approach yields a fair result in which 30% of the votes yields 30% of the seats. Direct election of representatives and accountability to voters. Almost every vote will count to define the makeup of the legislature. Almost every voter will help elect a representative who shares their values. All regions will have representation in both government and as part of the opposition. A single party will no longer be able to attain a majority government with just 40% of the vote. Cooperation and compromise will become the norm. Proportional systems can be designed in different ways. Fair Vote Canada believes any proposals for PR in Canada should be “made-for-Canada” proposals that retain a strong element of local and regional representation, while ensuring that representatives are directly elected by the voters and personally accountable to them. These criteria have led Fair Vote Canada to propose regionally-based models in which voters personally elect all candidates. Mixed Member Proportional (MMP) as envisaged for Canada would involve the creation of top-up regions normally including from 8 to 16 representatives. About 60% of these representatives would be elected as they are now, using first-past-the-post in single-member ridings. This would free up about 40% of the available seats to be allocated as top-ups to ensure proportionality overall in each region. In the transition from our current system to MMP, existing single member ridings would be made larger to make room for the top-up seats and avoid having to increase the number of seats. Citizens wishing to contact their representative would have a choice of contacting their local representative or one of the regional representatives. Single Transferable Vote (STV) is a multi-member model. Instead of electing representatives one at a time in single-member ridings, we group a number of ridings together and elect group of representatives that reflects the diversity of voter preferences in the STV district. Each voter gets a single vote, using a preferential ballot that allows voters to express their preferences 1, 2, 3 for as many candidates as they wish to rank. Candidates need to achieve a certain share of the vote to win a seat. Local PR is a multi-member system based on the same principles of STV with a twist in the counting system to ensure that one locally-nominated candidate is elected in every current local riding. Citizens wishing to contact their representative could choose from any of the elected representatives in their multi-member STV or Local PR district. This might be a representative from the party of their choice or one closer to home. Rural-Urban Proportional combines features of both multi-member and top-up systems, and is designed to accommodate the specifics of Canada’s varied geography. The aim of Rural-Urban Proportional is to avoid creating exceedingly large multi-member ridings in sparsely-populated parts of the country. The number of seats per riding would be reduced in such areas, which could include a certain number of single-member ridings if necessary. To ensure a high level of proportionality despite this feature, the system would include a small number of top-up seats at the regional level. Citizens wishing to contact their representative could choose one from the party of their choice or one closer to home.